Ah, what it is to be popular. A pipeline that’s bubbling over with leads sends waves of opportunity and optimism through any business. But, as every good salesperson knows, attracting leads is not the same as converting leads. Lead conversion is no more crucial in the manufacturing industry than any other, but there are some industry-specific resources we have at our disposal. Harnessing these can exponentially increase conversion rates. Here are six insanely simple techniques for nudging hot prospects along the pipeline and turning them into truly satisfied clients. Making big-ticket purchases, manufacturing clients need to be utterly secure in their procurement decisions before they sign on the dotted line. One of the fastest and most effective ways to influence this is with advocacy. That is, asking influential, existing clients to be an advocate for your products and services. How this is done is dependent on the product, service and clients at hand. User groups are popular, allowing prospective and existing clients to come together with technical specialists, to analyse and progress the development of a service. Advocacy can also be in the form of a case study, coverage in an industry magazine and testimonials on your website. Also known as social proof, it’s a proven way to influence conversion rate marketing. 63% of manufacturers rely on referrals to generate leads. In terms of conversion, this can be a highly effective source of potential customers. If well qualified and introduced, it delivers a combination of advocacy and direct contact. It at once reduces the sales cycle and compounds the conviction to choose your business. To super-charge your referrals, ensure this is not a passive activity. Don’t wait on the sidelines for a well-meaning customer to mention you in passing to a potentially suitable prospect. Guarantee your customers will sing your praises by utterly delighting them post-sale, make it easy for them to refer you and consider an appropriate incentive. John Lewis vouchers may not cut it. An incremental discount for each referral might. Inbound Marketing works on interaction, not an interruption. It focuses on reaching your potential clients at their point of interest. Rather than relying on outbound methods, like advertising or buying email lists, it develops high-quality content that attracts people towards your company. How does it work? Well, a bit like this! Here you are, reading this article about converting leads, created by a company of marketing experts. I’m not saying you’ll definitely choose Red-Fern Media to help you generate and convert leads, but according to Sales Benchmark Index, a sales team has a 56% greater chance of achieving targets if you engage buyers with content before they contact a seller. The lead conversion is influenced by a series of factors. To the untrained eye, the strategy appears bloated and complicated. Why not pick up the phone and have a chat? Why push out all this content and hope and pray? In truth, it’s a highly-targeted practice that relies heavily on data to pinpoint audience needs and behaviours. Agile in nature, inbound experts react swiftly to that data to enhance content types and distribution techniques. Inbound marketers work to constantly improve conversion metrics. 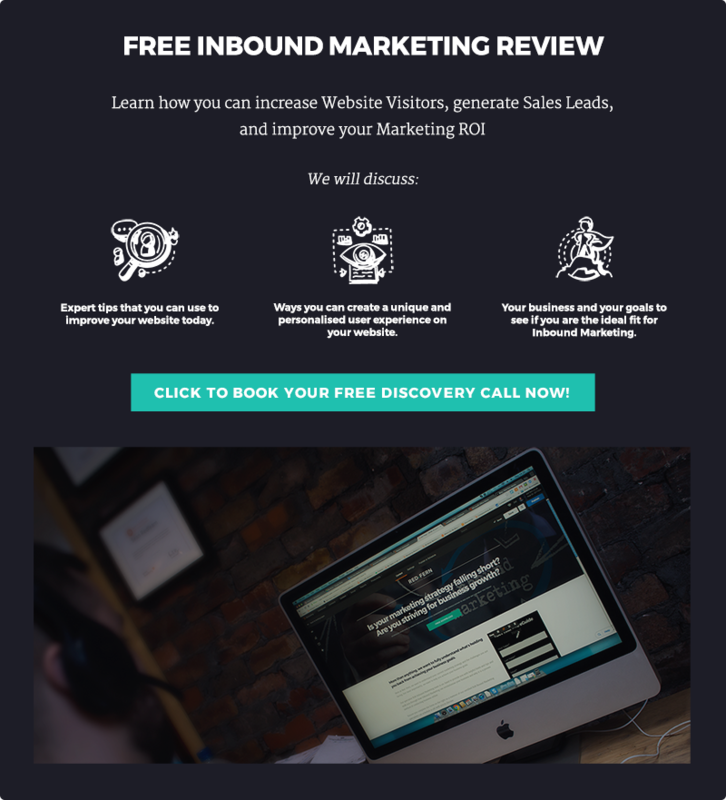 According to marketing company Cyance, Inbound Marketing doubles website conversion rates, delivers 54% more leads than traditional outbound marketing practices and costs 62% less, too. At the heart of Inbound is great content. Demonstrating authority on a subject and providing your audience with all the information you need to make an informed decision, your content influences your audience before you lift the receiver. The result is a prime prospect, who knows your product and is ready to commit. A call to action (CTA) tells your audience what to do. Often overlooked, it’s a vital element in all marketing activities. For manufacturing companies, the power is in what you ask your audience to do and this must be mapped to where your audience is in the sales cycle – so knowing what they need when is critical. A prospect at the early awareness stage will devour information, wanting to broaden and deepen their understanding of products and services that solve their problems. Your calls to action here should drive people to ‘download the e-book’ or similar. Serve them rich information that feeds their need for research and evidence. Follow this with content containing a CTA for a product catalogue, when prospects are at consideration level and are assessing their options. This gives them specific information they can compare to other marketplace options. Finally, create content containing a CTA that asks them to ‘request a quote’. This takes them to the crux of the sales cycle where salespeople and technical experts can convert them into a client. and they’ll be ready to take their purchasing decisions to the next level. Email is almost 40 times better at acquiring new customers than Facebook and Twitter. Playing a key role in Inbound Marketing, it’s no wonder this appears here as an insanely effective technique for converting sales. Once you’ve earned permission to enter someone else’s inbox, you’re entering hallowed ground and it is essential to show respect. Send information that’s informative, useful and authoritative. Email marketing is about nurturing an audience and helps convert leads in the same way traditional networking does. Like, know, trust is the name of the game here. Build a strategy around your email marketing, carefully segment data so your messages are targeted and consistently hit the send button to build trust, rapport and eventually conversions. Seductive, well-written and utterly convincing, landing pages convert website visitors into well-qualified leads. Using a combination of audience pains, future-visioning, social proof and irresistible positioning, these written web-based works of wonder are the final stage before purchasing takes place. By highlighting the agony of an acute audience pain, landing pages first build rapport. They then begin to solve the problem by envisioning the future (“it doesn’t have to be this way!” they cry) and then fill the reader with confidence and conviction by presenting evidence, social proof and a well-balanced argument. It should handle every irksome worry the buyer might have, and offer a choice so compelling (and comfortable) they have no choice but to go ahead. Some industries like to use time-limited offers to convince clients to come on board. In manufacturing, we know this level of sophistication is not good enough. Rather, guarantees are more likely to convince. A three-month break clause or refund is a more compelling and fitting promise here. Each of these 6 techniques for converting leads require of you one thing: know your audience.